The Milano series is an extension of an electric guitar that I designed for my friend and amazing musician, Kevin Breit. 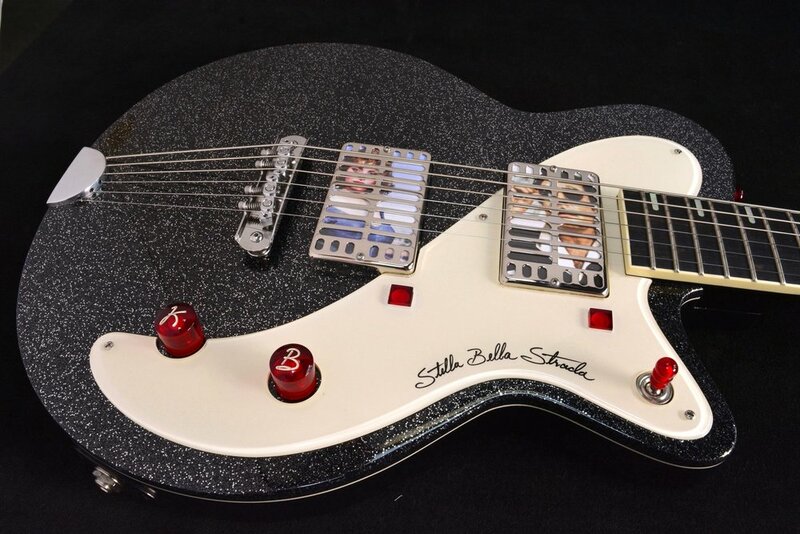 His electric, the Stella Bella Strada, was inspired by electric guitars that were produced in Europe, especially in Italy in the 60’s. Guitar brands like Wandre, Goya, Eko, Galanti, etc.. provided a path that led me to designing the Milano series. 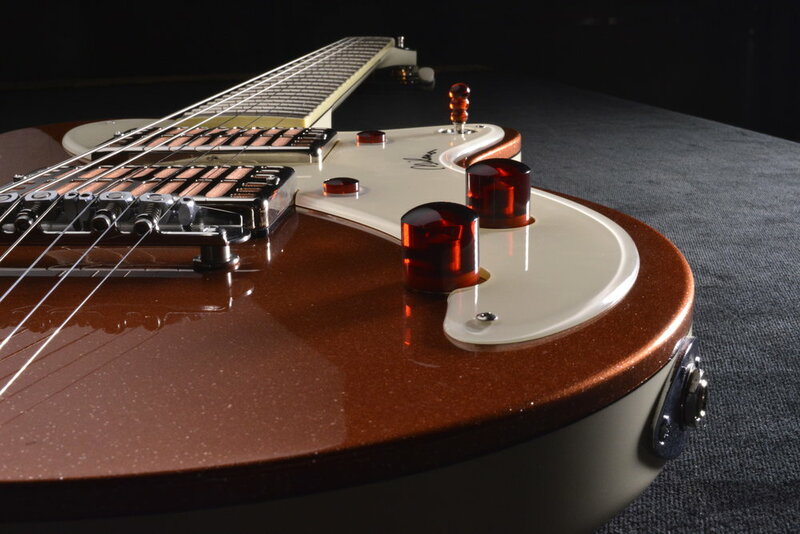 These curious Euro electrics made a strong visual statement using plastic, metal, sparkle lacquer, and celluloid pearl in ways that American guitar manufacturers hadn’t considered. Kevin called me up to see if I would be interested in making him an electric to use on a new recording project he was working on. Initially he asked if I could build him a version of an old Premier electric. He called back a few days later and decided he would rather have me build him an electric using my established body shape. He had three requests, the first was to the have the body made from solid mahogany, my electrics have been hollow for years so I was looking forward to doing a solid version. 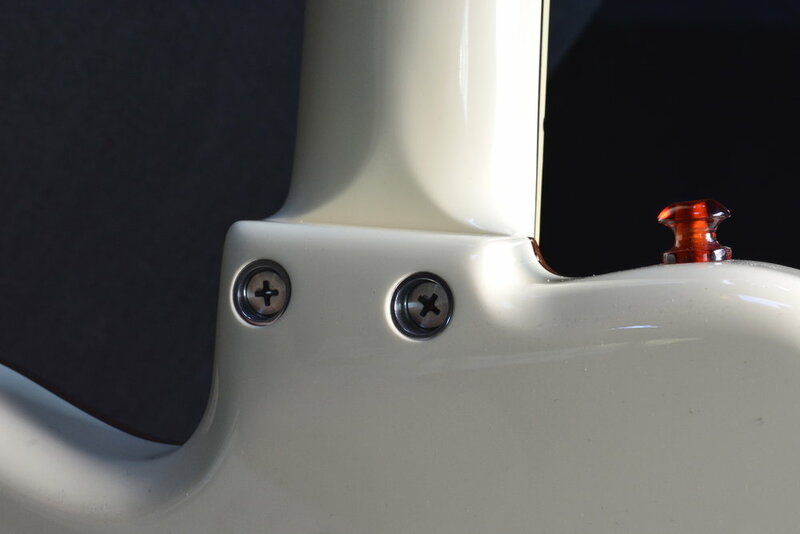 The second idea was to have the scale length 25-1/2”, and lastly, he wanted to use Mojo Dual Foils, Marc Ransley’s take on what a gold foil style pickup would be like when two gold foil coils were wired side by side into a Humbucking format. For the bridge I chose A Mastery M-1, one of the most functional, beautiful pieces of bridge hardware available anywhere. 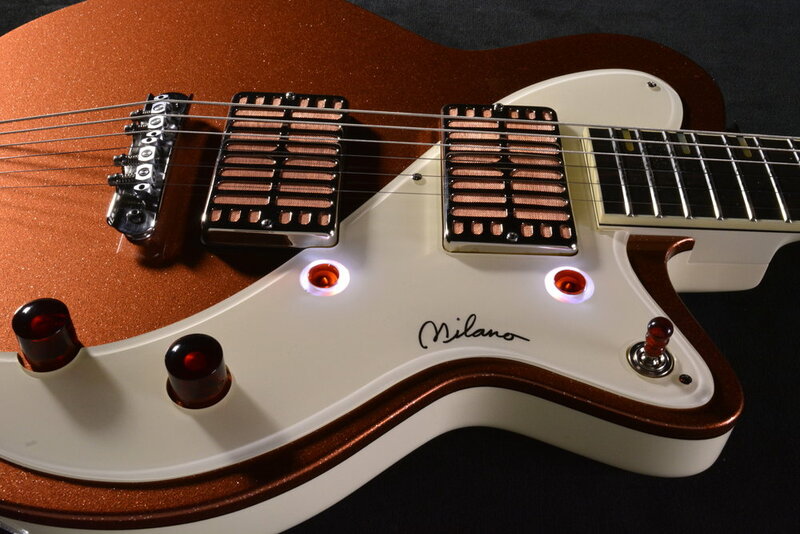 The Milano is a limited edition of ten instruments. All ten will share the same specs, the difference between the instruments will be the lacquer finishes. 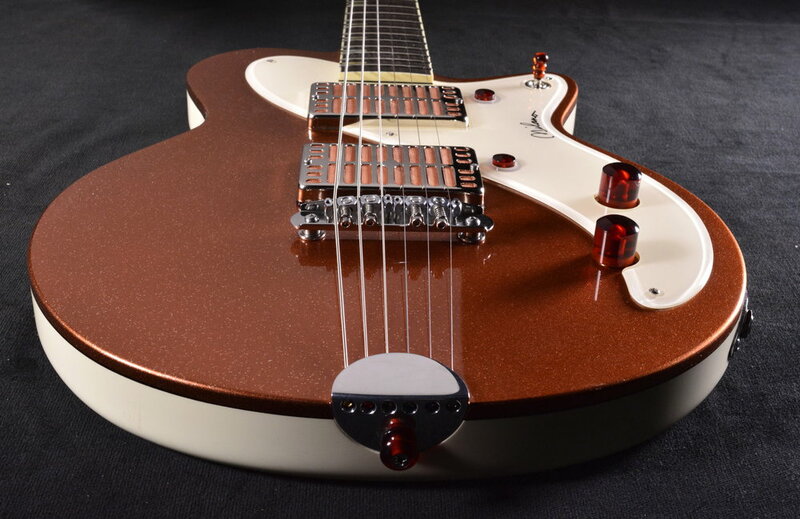 Each in the series will have a different color sparkle top cap over either Jet Black back, sides and neck, or Mascarpone Cream as pictured on the copper top version. Body and neck – Honduras mahogany. 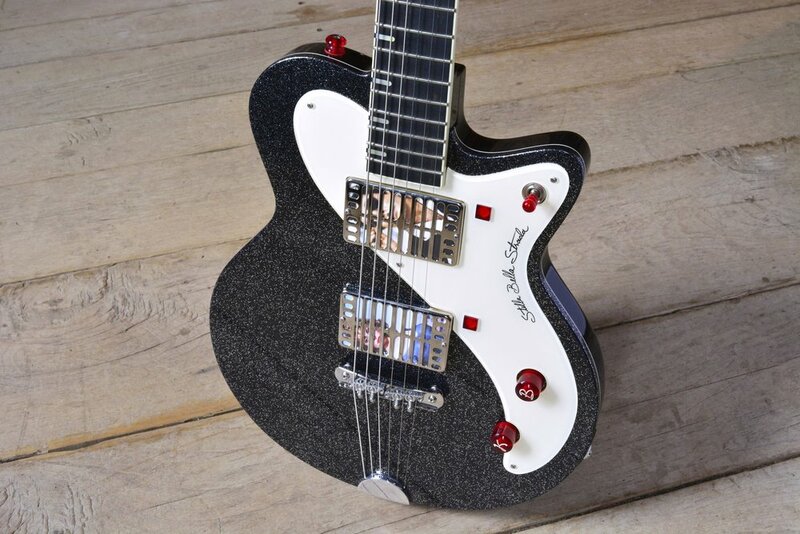 Fingerboard – Black ebony or Macassar ebony – 12” R.
Pickups – Mojo Dual foil humbuckers. Coil Split switches – DPDT button switches which light up when engaged indicating single coil mode. Powered by three 2032 lithium batteries. 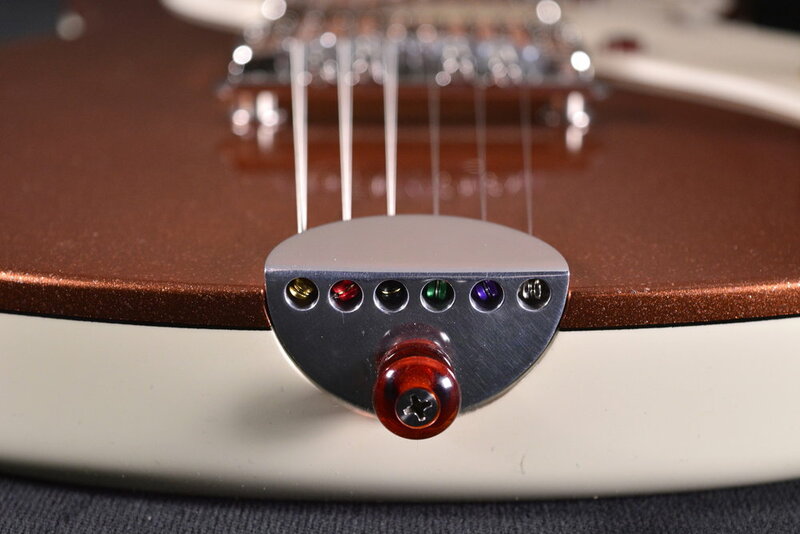 Tailpiece – Custom handmade polished aluminum demi-lune routed flush into the body. 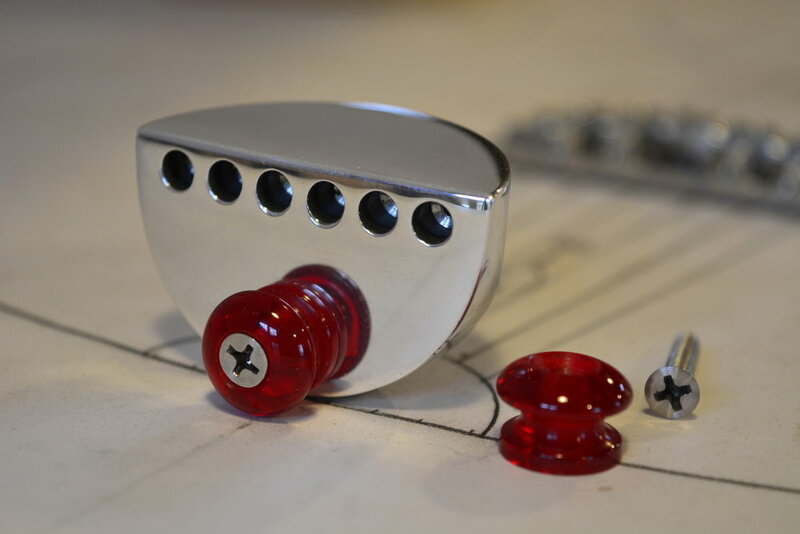 Translucent cast resin parts – cast block machined into vol/tone knobs, Gaggia style toggle switch tip, coil split buttons and strap pins. 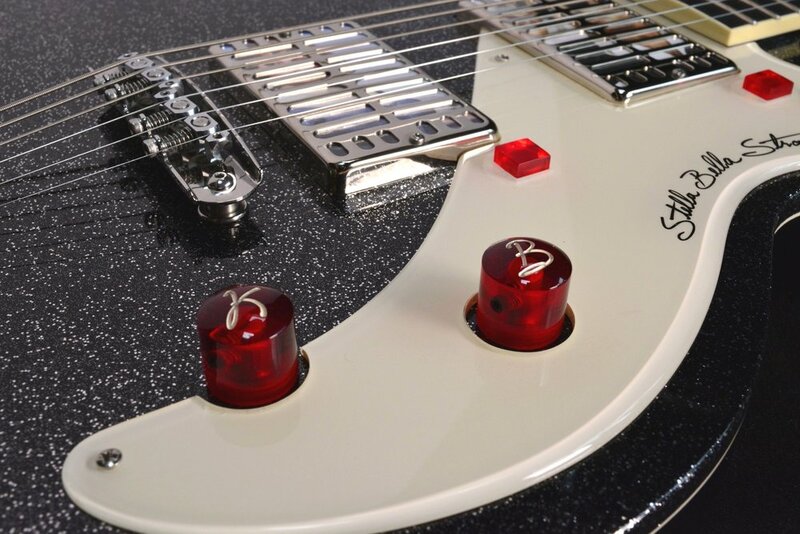 Tuners – Waverley open back with alternating ebony/Ivoroid buttons. Case – Ameritage / Yanuziello, custom color exterior and interior, form fit, plush lined.